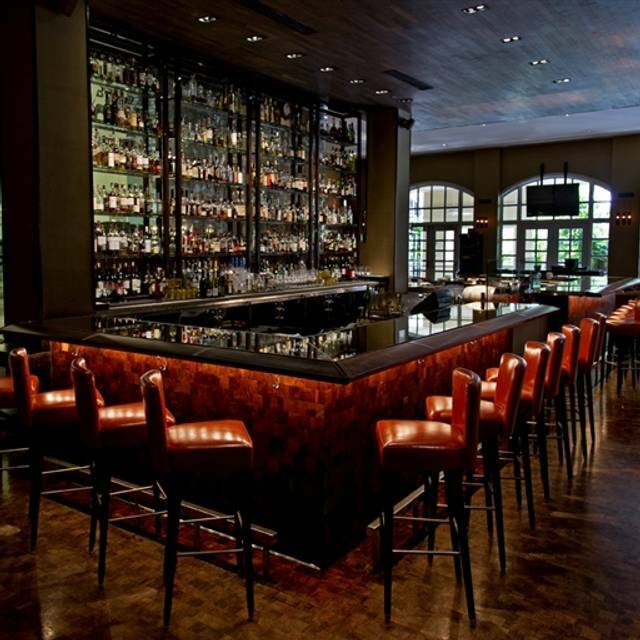 You must make reservations at least 5 minutes in advance of the time at Bourbon Steak by Michael Mina - Miami. Valet is reduced to $10 per car for all guests that dine with us. Bourbon Steak by Michael Mina - Miami can accommodate your party, large or small and can host special events for either lunch or dinner and is available to reserve in its entirety. BOURBON STEAK also has a private dining room suitable for groups up to 30 guests as a seated function and a second private glass terrace that seats up to 14 people. Bourbon Steak is the perfect place to host your next party and is a great venue for business functions, birthday parties and weddings. The restaurant has 2 private dining rooms and a lounge that can be turned into a semi-private dining space. The restaurant can also be reserved in its entirety for either lunch or dinner. Located in the famous JW Marriott Miami Turnberry Isle Resort & Spa, Bourbon Steak by Michael Mina - Miami is Michael Mina's modern twist on the classic, American steakhouse. One of South Florida's favorite steakhouses, Bourbon Steak by Michael Mina - Miami offers contemporary American fare with a focus on prime cuts of all natural, organic and hormone-free beef and the freshest seafood available from around the world. Always a good idea since the food is good and so is the service. However the largest deterrent is the noise level. You cannot hear the person next to you. Can't something be done? You will experience a level of fine dining that would be hard to top. The service is professional including the support staff that attends to the table when your waiter is away. The dry aged "bone-in" Ribeye was flavorful and tender. The side we ordered was a risotto / lobster that was a special that night. The waiter (Chris) is knowledgeable in the wines available and made it a relaxing night with nothing missing. Truly a memorable evening at Bourbon. I must come back more often. With the exception of the seats (soft, lounge chairs that sink in as one sits making it quite uncomfortable to slice that delicious steak, oh and the folks that are forced to sit on the couch with a tiny pillow for back support) the service was A+, quality A+, wine selection - very extensive, overall awesome (but for the seats). Would I go back, perhaps. AMAZING food and amazing service!!! Really worth the money for an excellent meal. 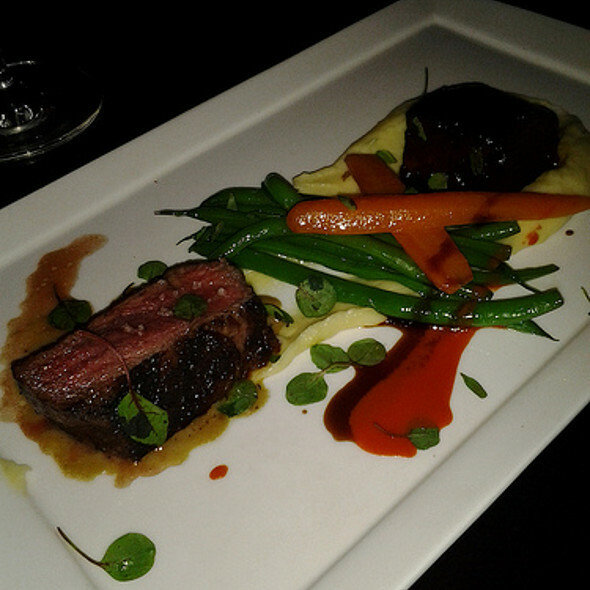 Bourbon Steak by Michael Mina is always the perfect choice! I dont usually leave feedback but this place demands it. I was half expecting the place to be much more pretentious than it ended up being. My wife and I walked in and were immediately whisked away to a land where we were pampered, treated like the king and the queen of the place. The service is BAR NONE the best service I have EVER experienced. Our servers name was Franklin. Normally I do not remember names, but this guy was hands down the nicest and most professional server I've ever had the pleasure of experiencing. He was NICE, and ON POINT, made NO mistakes, went above and beyond and OUT of his way to make us happy. The food was remarkable, the presentation was beautiful and the drinks were amazing. I only wish I could afford to eat here more often. Like all good things, it was expensive. Worth EVERY penny but expensive. 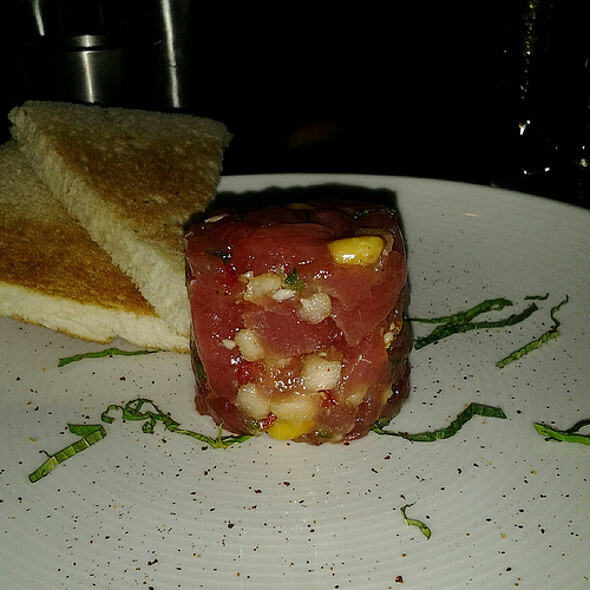 Looking for a great dinning experience with amazing options for the most sophisticated palate this is your place. The wine list is absolutely brilliant! MY FAVORITE RESTAURANT!! Great food, service and ambiance. Thank you Craig for always making the experience memorable!! You are truly the BEST sommelier! The Waugh and the Prime Rib were amazing. Would definitely recommend this to anyone looking for an”Special” night out or even something as simple as having a great meal with friends/family which is what we did. 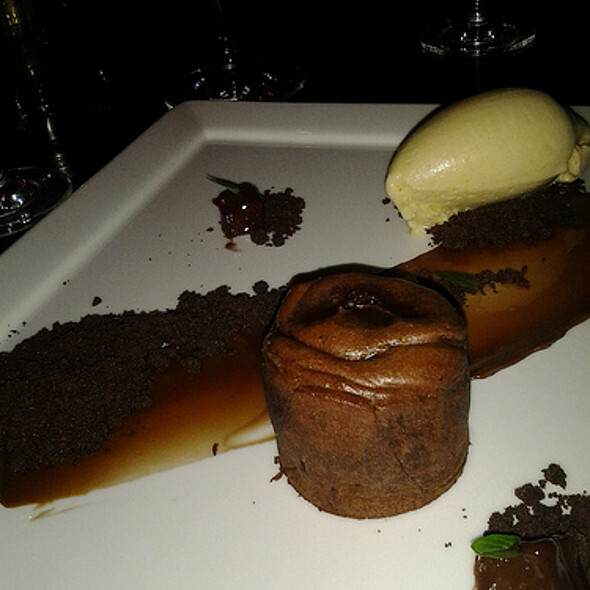 We love Michael Mina’s restaurants and hadn’t been to Bourbon Steak in a long time so we went. We arrived a little early and were seated at reservation time. The place was very busy. Service at bar while waiting for table was slow. I was not acknowledged, a seated couple even tried to get the bartenders attention for me because they noticed we were not acknowledged for a while. We were finally seated at a sofa/table, not an ideal seating and a bit uncomfortable. The table was at the waiter station and seemed like it’s a table they throw a couple at because 2 ppl dining is a waste of space for them. I kind of felt like a child who was punished and put in a corner. The waiter came over fairly quickly and handed menus. Specials were divulged and he took our order. Caesar salad came out in a fairly timely manner, no offer of black pepper from anyone. We had the flag someone down to grind some pepper on our salads. The dressing was not a classic Caesar dressing and neither one of us was a fan of it. Then we waited, and waited, and waited. Finally our entrees arrived. Wow it took a really looooong time. I order the Rib cap steak which was spectacular. My husband ordered the Skirt Steak which he didn’t care for. It didn’t come with any Chimichurri at all, just an over salted piece of meat, no sauces. The side order of grilled Vidalia onions (average) and “roasted” cauliflower was nothing special, tasted just like steamed cauliflower. The waiter never returned, not once, to check on us at all after entrees we’re finally brought out. This solidified my sense that if you are a two top dining, you just don’t rate as highly as a 4 top. Sad considering the high price of dining there, more $$ than Prime 112, our check was $250, I only had 1 glass of wine. Plates were cleared I ordered desert (beignets w the vanilla creme brûlée) it was delicious but not enough for 2 ppl. Got our check, paid and left. Validated valet ticket will still cost you $10. Poor service at best. Took 15 minutes to seat us and we had reservations. Our server Claudio was amazing, very attentive and really nice. Food was fantastic! The service was excellent plus the food was absolutely delicious. It’s a shame really. I had been to Bourbon Steak before and it was one of the nicest swankiest restaurants. Tonight I wanted to take my cousin out for her birthday, along with my partner and my mom. We were greeted nicely upon arrival and we were seated in a secluded booth. This is when I started to notice things were different. The music was way too loud. One can let that go if it’s good music. This wasn’t. It was loud, cacophonous and obnoxious. For some reason they had a TV hung on the wall in the dining room with a basketball game on. In came a family of 8 who proceeded to be more loud and obnoxious than the music. They shouted and screamed at the the basketball players, as if they were at Hooters or in their trailer home. We requested the server to please ask that they pipe down because their shouting was really ruining our experience. The manager came back saying that it was “tough to control people while watching sports.” Which begs the question, sports, in a high-end restaurant that sells foie gras, along with $3500 bottle of wine in the cellar? No. The family kept on being loud, and I mean really loud, other tables kept shushing them. They kept on. We ate our dinner, which was delicious, but in the end asked the server to remove the obligatory 18% gratuity. While the service was just OK, I’m clear it’s not the servers fault, but I was making a point. The manager came back and removed the amount of the gratuity off the main bill, while leaving the gratuity on, with which I was OK. The reason I’m blaming the restaurant for my poor experience, and not that disgusting family, is because they misread the room (or their own clientele) when they decided to install a TV in the dining room. What is this Flannigans? Big mistake, HUGE. Never again. Go at your own peril. Great place for a date. The steak was great but not worth the value. You have to add and pay for sides. Overall the service and experience is worth the try but had better for the price. Never a disappointment. We love it every time we dine here! expensive. quality not up to par. value as a result was poor. service, with Michael, was great. THE SERVICE AND FOOD WAS EXCELLENT. As a fellow in the biz we were treated as V.I.P. and it was by far our favorite dining experience we have ever had. The bone in dry aged ribeye was simply amazing. Our truffle oil mac n chz was to die for. There was nothing to complain about. THANK YOU GUYS FOR EVERYTHING. I am a frequent guest. Wanting to impress our guests. Called in advance for nice table. Used to better service and will rethink about coming back. Beautiful restaurant ! Unfortunately we had to return one filet mignon (not such a good cut compare to the other one ordered at the table and overcooked since we ordered medium rare and got medium well) ! Unfortunately no compensation, not even coffee and my husband got his steak when we all finished eating !!! It was a party of 4 ! Too bad ! It was not our first time at the restaurant but we had I guess a bad night !!! Absolutely the best! Filet my husband had was like butter. 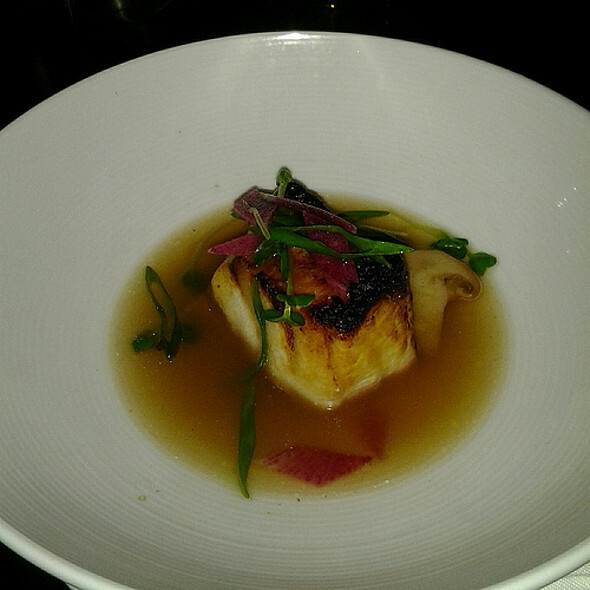 My yellowtail snapper amazing. The truffle Mac and cheese to die for. Ended with the banana dessert the waiter suggested and it was the perfect ending. Can’t wait to go back. Yumm! Bourbon Steak consistently creates a fun welcoming environment - great service, comfortable seating and fun vibe. Food is excellent and always fresh. We brought out of town friends with us and they loved it! Always a great time at Bourbon!! Start with a warm welcome from the host to a great service from the servers. Also, management would check in time to time to insure everything was great with our service. Very expensive and our waiter kept trying to up sell us at every chance. We have eaten at this restaurant many times. Cumpleaños de mi nieta. Un poco overprice y muy ruidoso. Expensive but quality food with great service. Not great for conversation as the din of the room is quite loud but steaks amazing. Meh. This place is a good steak house but charging top dollar prices. Wine list great and sommelier very good. But the regular steaks are fine not great. Did not try the wagyu meats. I ate here two nights in a row during a conference so I gave it 2 chances. Same experience. Love it all the time!! Never lets us down! Everything was wonderful except the main dish! The steaks were severely undercooked. staff is always great. Craig is the best. Peter at the bar good too.